Because the appearance of your smile is important, Dr. DeAngelo may recommend white crowns to repair teeth that show when you speak or laugh. White crowns are made of porcelain or porcelain fused to metal, and they restore teeth with significant decay, cracks, or other damage to full strength and health. In some cases, back teeth require all-metal crowns because of the intense pressure they must withstand. If you need a crown, we'll schedule two appointments for the entire procedure. Dr. DeAngelo will prepare your damaged tooth, make a dental impression for our laboratory, note your tooth color with a shade chart, and then attach a temporary crown to protect your teeth until the final restorations are ready. A dental ceramist will create your custom crown according to the precise impression we provide. Once your crown is ready, you'll visit our Homer Glen practice again, and Dr. DeAngelo will permanently attach the restoration. Before you leave your appointment at our Homer Glen dentist office, Dr. DeAngelo will assess the way that your top and bottom teeth come together. This is also known as dental occlusion. If necessary, Dr. DeAngelo will make adjustments to your crown to ensure a proper fit. Expect your new crown to keep your tooth healthy and strong for years to come! A fixed bridge is a set of prosthetic teeth that is custom-made to replace one to three missing teeth in a row. 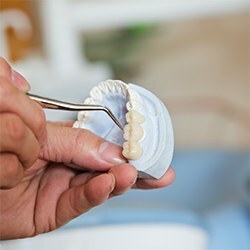 Glen Homer dentist Dr. DeAngelo works carefully to ensure that a bridge is the best option for his patients, and takes diligent notes about the appearance of your existing teeth. This way, a bridge can be created to blend perfectly into your smile. Crown and bridge treatment is a good alternative for patients who do not qualify for dental implant placement. When your bridge arrives at the Homer Glen dental office, you’ll return to have it placed! This type of restoration maintains its place in your smile with the help of dental crowns! 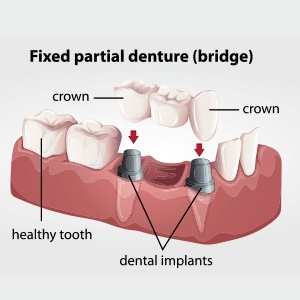 Two crowns, one on each side of the bridge, will anchor your prosthetic firmly in place, allowing you to enjoy a fully functioning bite. This crown and bridge system helps Homer Glen patients renew their outlook on life as they enjoy their favorite foods and a full smile once more! Call us today to schedule a crown and bridge appointment with Dr. Alan R. DeAngelo.